The 2016 European Development Days (EDD) are fast approaching, with a focus this year on implementation of the 2030 Agenda on sustainable development, and multi-stakeholder contributions that can make this EDD an especially engaging and participatory forum. In the spirit of cooperation, the EU-ACP Technical Centre for Agricultural and Rural Cooperation (CTA), the EU-ACP Technical Barriers to Trade Programme (TBT) and the EU-ACP TradeCom II Programme will jointly organise two unmissable debates at the EDD2016 on pressing development issues in African, Caribbean and Pacific countries (ACP). 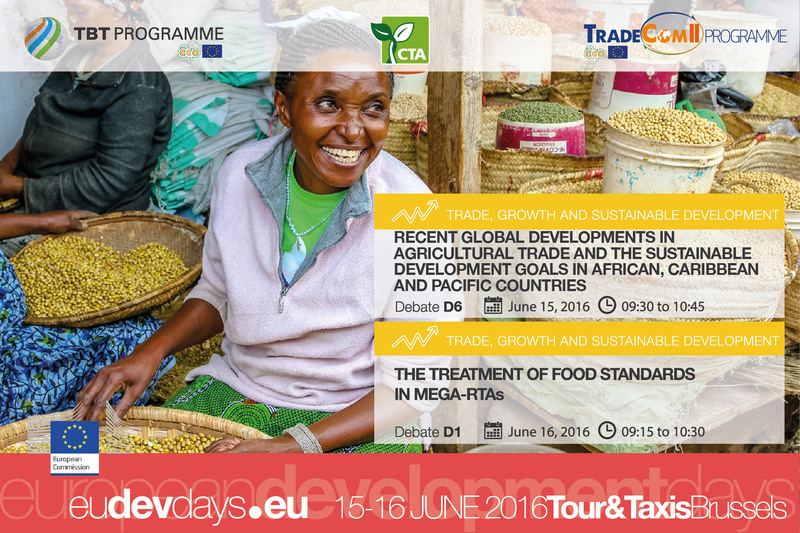 The first debate on: “Recent Global Developments in Agricultural Trade and ACP SDG Pursuits” will take place in Brussels on the 15th of June 2016 – 9.30 to 10.45 AM. This debate will bring insight from experts and engage participants on how current and future trends in agricultural trade and investment, and enhanced public private partnerships, can support development in the poorest countries. Panellists including Arancha González (Executive Director of the International Trade Centre (ITC)), Daniel Gad (Managing Director, Omega Farms Ethiopia) will debate on this subject and share their views with the participants. The second debate entitled: “The Treatment of Food Standards in Mega-RTAs Policy Implications for ACP Countries” will be held in Brussels on the 16th of June 2016 – 9.15 to 10.30 AM. The rules governing global trade are increasingly being defined by mega-RTAs such TTIP, TTP and RCEP, with important development implications for the ACP in terms of full integration into global value chains, capacity to negotiate regulatory frameworks, and ACP producers’ ability to meet compliance costs, including tighter food standards. This panel will see the contributions of experts such as Roderick Abbott (ECIPE), who will discuss and bring insight on what recent global trade developments mean for ACP development interests.